There are reports that iPhones, iPads and Macs worldwide have been crashing while using the address bar in Apple's Safari browser. 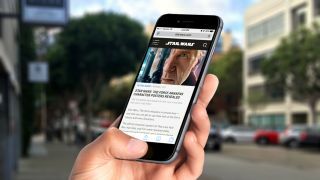 It looks like the problem – which affects both the mobile and desktop versions of the Safari browser – is caused by Safari's search suggestions feature. When you type in a URL, Apple sends what you've entered to its servers and comes back with autocomplete search queries. The idea is that this makes going to websites quicker, but in reality it appears a bug in the server request is causing Safari to crash. While we wait for an official fix to the problem there is an easy workaround to avoid Safari crashing on your iPhone, iPad or Mac. Open up Settings on your iPhone or iPad and tap on Safari, and next to where it says 'Safari Suggestions' turn it to off. You can also enable Private Browsing mode to avoid this problem as well. To do this open up Safari and tap the Tab icon in the bottom right-hand corner and select Private. Or, you could try another browser such as Chrome. The issue seems to be present in iOS 9.2, iOS 9.2.1 and the iOS 9.3 beta, so it doesn't seem to be specific to a certain update. Techradar has reached out to Apple to find out when an official fix is due and we'll keep you up to date when we hear back.